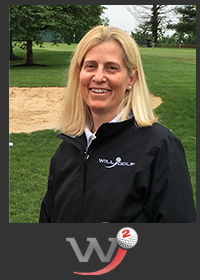 Maggie Will is a three-time LPGA Tour winner and longtime Tour veteran, experienced golf instructor and innovator, former college golfer and college golf coach, and founder of Will2Golf, the most comprehensive online golf tournament search and schedule-building site for junior golfers. Leaning on her more than 40 years in the golf world and her experiences as a player, teaching professional and coach, Maggie has built the premier web resource that guides junior golfers of all ages and all skill levels as they create their path to playing opportunities. Maggie has been a member of the LPGA Tour since 1989, the PGA of America since 2000 and the LPGA Teaching & Club Professionals since 2009. Maggie, a native of Whiteville, North Carolina, was inducted into the Greater Wilmington (N.C.) Sports Hall of Fame in 2013. During her more than 20-year LPGA Tour career, Maggie won the 1990 Desert Inn International, the 1992 Sara Lee Classic and the 1994 Children’s Medical Center Classic. Following her competitive playing days, Maggie served as the head women’s golf coach at University of Richmond, where she was named CAA Coach of the Year, and also served as an assistant coach for the women’s golf programs at UNC Wilmington (2012 CAA Championship Team) and North Carolina State, the men’s golf program at Virginia Commonwealth and as a teaching professional at The Creek Club. Along with many junior titles, Maggie was the Carolinas Golf Association Junior of the Year, North Carolina Women’s Amateur Champion and a member of the NCAANational Championship runner-up team at Furman University under Hall of Fame Coach, Mic Potter. In addition to her playing and coaching careers, Maggie has published many articles on golf techniques, tips and course management as well as contributing to Golf Magazine’s: The Best Putting Instruction Book Ever! She also is the founder and owner of Get Fit For Putting, a lesson-based and putter-fitting business.